The Vistual River - Per usual, the first stop upon arrival in each new city we visit is a scenic location for a cocktail. In Krakow we chose a cute river boat restaurant overlooking the Vistual River which is the largest river in Poland and runs through the center of the city. It was here that we discovered the good news: drinks are cheap in Krakow with beers averaging no more than $2 each! The Main Market Square including the Sukiennice Cloth Hall and St. Mary's Basilica - One thing we see time and time again in European cities that we don't see here in the U.S. are the incredible main town squares. Sure, in Grand Rapids we have Rosa Parks Circle or Calder Plaza, but those don't hold a flame to the squares you find in Europe. Town squares are the 'center of it all,' filled with life during the day and romance at night. We partook in the many restaurants around the main square for lunch as well as for after dinner drinks. Wawel Royal Castle - One cannot go to Eastern Europe without seeing a castle (or ten!). In Krakow, the castle to see is Wawel which was conveniently located just across the street from our AirBnB. For this tour, we opted to skip the indoor portion and instead walked the castle grounds for free. 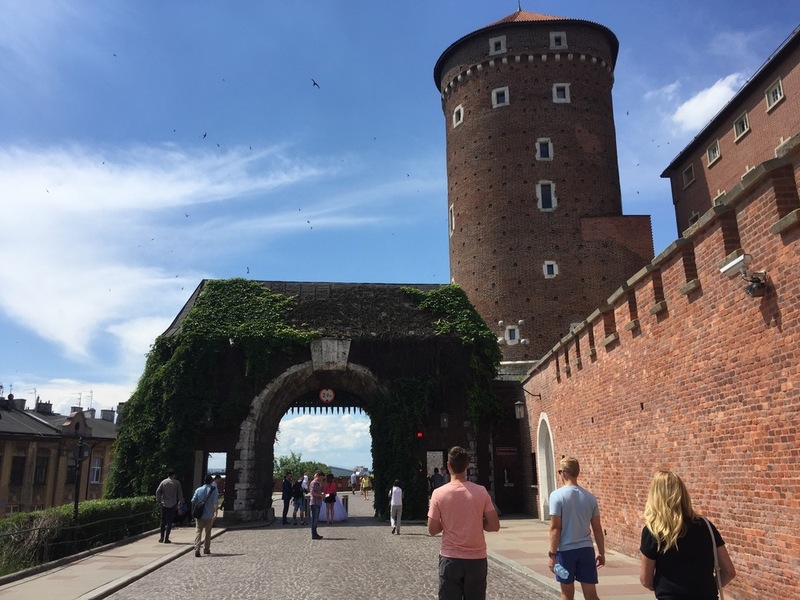 According to our 5th passenger Rick Steves (a very popular travel guide of whom we rely on heavily), Wawel is the most historically and culturally important site in all of Poland. My favorite part of the tour was enjoying a glass of procecco on one of the patios overlooking the gardens. Enjoying beers and an 'iced coffee' (aka gelato with a touch of coffee on top) in Planty Park. Planty Park - This is one of the largest parks in Krakow and makes a complete circle around Old Town. This park marks where the old Medieval walls used to stand around the city. Many people walk and ride bikes around the circular park and on this particular afternoon we enjoyed a stroll of our own. Along the way there are many fountains, churches, restaurants, and mini cafes to stop and grab a bite or drink at. This was a relaxing way to see more of the city and was a personal favorite of mine. The Jewish Quarter - We took a full afternoon to explore the Jewish Quarter of Krakow. This 'neighborhood' is chalked full of culture including shopping, bars, restaurants and even smaller squares where there is a market for food vendors. At night the Jewish Quarter lights up with action including this patio bar (pictured above) that we found off a side street in an open alleyway. Here we enjoyed cheap carafes of wine and the unique atmosphere late into the evening < this is the sort of memory we travel for! The 'mysterious wine cellar bar' - On our last night in Krakow we exited our apartment to find a light drizzle on our way to find dinner. As we walked towards the town center it started to down pour and we found shelter from the storm in a small restaurant off a side street. Upon entering, the server took one look at us and announced, "I know where you want to go." She led us down a series of 3 flights of stairs and we followed without question just happy to be out of the rain. Moments later the small underground hallway opened to what appeared to be an old wine cellar now fashioned into a beautiful private bar complete with a bartender wearing a wooden bowtie - no joke. It was wooden. There we partook in some of the fanciest cocktails we've ever experienced including a smoked manhattan as well as a gin martini with kale. And the best part?!... if you recall the note about 'cheap drinks' from the Vistual River, the best surprise of the night wasn't stumbling upon this spectacular experience, but the bill (if you can even call it that) being so affordable! Our only regret: not taking note of the name of the bar! We never did make it to dinner. 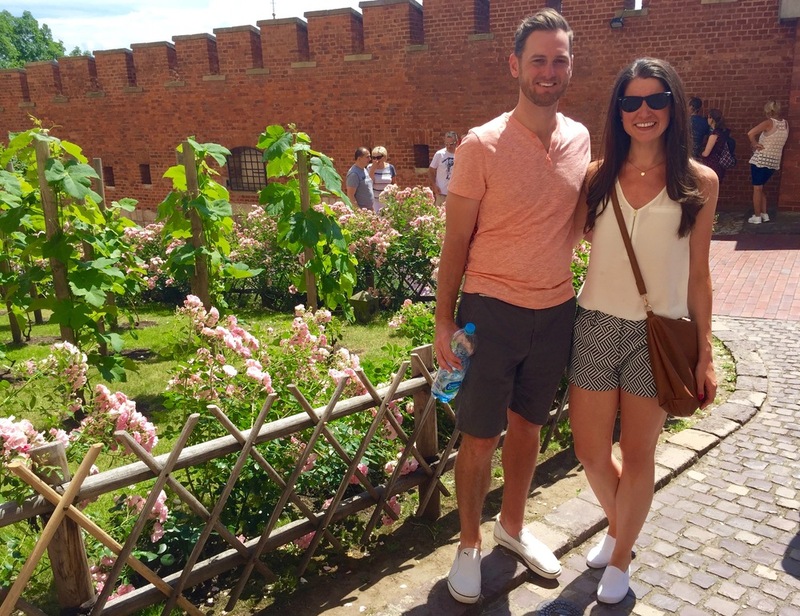 Touring the grounds at Auswitzch Concentration Camp in Poland. Auswitzch Concentration Camp - With heavy hearts we made a stop at Auswitzch on our way out of Poland. It was not an enjoyable experience but one most certainly worthy of our time and attention. The displays were powerful and walking the ground where so much evil took place was an experience we will never forget. Next stop on the Eastern European tour: Prague, Czech Republic. POSTSCRIPT - A place where I share things I'm particularly into at the moment. Selfie Sticks - I am in LOVE with selfie sticks! They are hilariously awesome. Get one! Doner Kebobs - These things are everywhere in Eastern Europe and I love them. We are lucky to have Sammy's Gyro just down the street from us in Eastown. The movie 'The Hateful 8' - My travel comrades 'hated' it ;) but I absolutely loved it. I watch it on the plane and found this movie extremely entertaining and oddly humorous. I recommend!